Jeff For Banks: Is the pie getting smaller? I have what I consider a very astute friend. He’s a relatively young guy (in his 40’s), and seems to be very smart with his money. I perceive him as being a very good bank customer. When he told me he does a family balance sheet every year, he piqued my interest. I asked if he would be willing to share it with me in common-sized format, changing the numbers to percents of his total assets. He only counts his financial assets and liabilities, and only counts fixed assets such as his home if he borrowed against it. 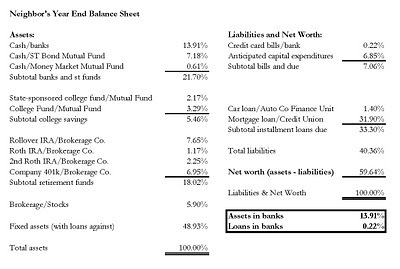 Having a mortgage and an auto loan, he therefore counted his estimated market value of the car and home in his assets and included the loans in the liabilities. The results of his efforts are in the accompanying table. My suspicions were confirmed. Less than 14% of his family’s assets were in a bank. Brokerage companies and mutual funds were the benefactors of the majority of his financial assets. His mortgage, the only significant liability, was with a credit union. The credit card balance was de minimus, and as you would suspect is with a large bank. 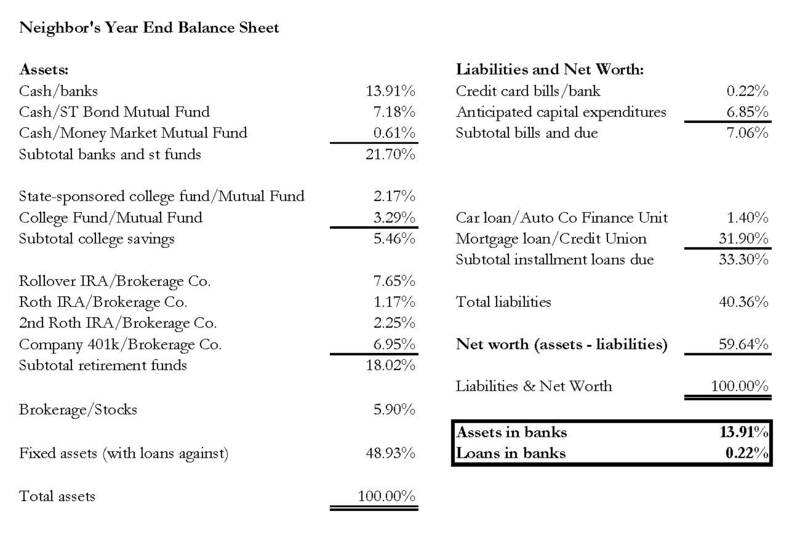 Is my friend’s balance sheet typical? I would not base strategic decisions on such a small sample. But perhaps we should reflect on our own family’s balance sheet and use a little common sense. In my opinion, my friend’s situation is probably typical for a family in their 40’s. It is perhaps not typical for those in their 70’s, as they may have more in the bank. It is these customers that give the banking industry the false sense of security and results in only minor tweaks to business as usual. Banks can also look at the nationwide growth in deposits for comfort. In the past ten years, deposits in FDIC-insured institutions grew approximately 7.4% annually*. But wait, in the past two years, deposit growth slowed to 4.7% annually. I suppose the good news is there are fewer banks almost every day. Through mergers or failures, the flock is being reduced. That may also give us the false sense of security that all will work out for those that survive. But I suspect it’s not. Preferences are changing, particularly from one generation to the next. Younger families are putting their serious money outside of the banking system. If you believe this trend to be true, what is your strategy to deal with it? Should you accept it at face value and set your sites squarely on competitors to fuel your growth, going toe to toe for their customers’ 14%? Do you buck the trend, trying to win back a greater percentage of the next generations’ balance sheet, increasing wallet share to, say, 25% or greater? Or do you expand into lines of business that are already taking business from you, i.e. brokerage or mutual funds? Perhaps you should send up the white flag on retail and focus on businesses that tend to have a higher percentage of financial assets with banks? I think the answer lies somewhere within the preceding paragraph, and perhaps a combination of the above. What seems clear is that sitting back and doing nothing assures your future. You will have none. Put up the for sale sign. Investment bankers could use the business.